Vancouver, Canada -- There's something deliberately cartoonish about many kung fu movies, so it seems redundant to make an animated martial arts film. Yet despite that ancient wisdom, here is Kung Fu Panda, a messy concoction that looks as if they came up with a funny title and a lot of artists spent years trying to make something out of it. It's all over the place. Some scenes seem too frightening for children. The villain, a snow leopard named Tai Lung (voiced by Ian McShane), has a menacing glare, a sadistic snarl and a facility for kicking other creatures into the stratosphere. Jack Black voices Po, a clumsy panda unexpectedly chosen to fulfill an ancient prophecy and train in the art of kung fu in Kung Fu Panda. Some scenes seem too arcane. The movie rests on the Buddhist concept of nothingness, which is pretty rich if you saw the introductory event at the Cannes Film Festival where 40 people in panda suits lined up to salute Jack Black. Some of it seems redundant. We've seen too many live-action kung fu stunts to be impressed by the animated version of people running up the shards of collapsing stone bridges, no matter how carefully created. Some of it just seems silly, which is fine for a family movie, of course, but there's silly and then there's silly. Kung Fu Panda is silly. Black is the voice of as Po, the son of a noodle-making goose (parentage can be iffy in these movies) with dreams of kung fu glory. When the wise old tortoise, Oogway (Randall Duk Kim), picks the new dragon warrior, Po accidentally insinuates himself into the ceremony and gets the job. It's then up to Master Shifu (Dustin Hoffman), an unidentifiable little animal with big ears (possibly it's just supposed to be Dustin Hoffman), to train him. And he'd better hurry because Tai Lung is about to escape from prison, kick the pixels out of his rhino guards and return to the kung fu monastery to claim his crown, or whatever it is that angry jungle cats crave. 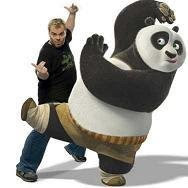 The fun is in watching Po learn to do kung fu, seeing as how he's fat and ungainly and voiced by Black in Nacho Libre mode Kung Fu Panda has a few jokes for the adults, but they're lost in the confusion of characters, motivations and lost opportunities. In the latter category we'd place the other kung fu masters from whom Po learns, including Tigress (Angelina Jolie), Mantis (Seth Rogen), Viper (Lucy Liu) and Monkey (Jackie Chan). Jolie has a few lines, but none of the others say very much, and so Kung Fu Panda is a martial arts film without a sidekick. Technically, it's well done and just the thing for children who would enjoy watching an idiosyncratic menagerie represent ancient Chinese culture. The good news is that Kung Fu Panda, like its namesake, is unlikely to reproduce in captivity.